Description: Poured very light yellow/straw coloured. Decent white head. Actually not much aroma (though that might be the slight cold I have). A little sweetness but refreshing and tasty. Light bodied with decent fizz. Thoughts: I almost didn't find this in the book – so a big thanks to Abs other wise this one would have slipped by. 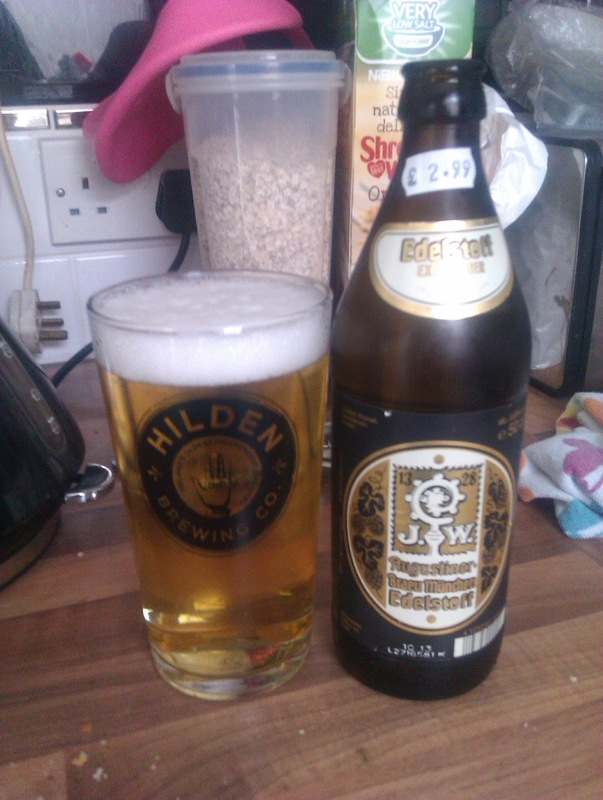 Not generally a fan of pale lagers but not sure I've knowingly had a Helles before. This was good. A perfect light, yet tasty, lager for watching the football, with a little sweetness and a decent fizz. Must try more Helles. Description: Poured hazy light yellow. Unfiltered. Smells of lemongrass, with a hint of sage. Next to no head. Lemon and sage flavours, no real beeryness (pretty sure that’s not a word but what the hell) about it. Thoughts: There's no doubt I enjoy a weird beer or two, but this just wasn't for me. It rates quite well on some sites, so may be its a marmite sort of thing. It'll not put me off this brewery as I loved their stout, maybe just a case of picking the wrong one this time! And if you've had it and liked it let me know, but I wouldn't buy again (though I did finish it, which probably says more about me than the beer...). Description: Caramel colour with a small white head. Strong grassy/piney hop aromas, with maybe a little honeysuckle/foral hint. Good strong hop bitterness. Some caramel and honey malts on the palette. Slightly oily/resiny finish. Medium body with decent carbonisation. Thoughts: One for the Hop Heads – and that’s a group which definitely includes me. Much more a strong bitter IPA, with decent caramel malts, rather than something lighter (see Founders All Day IPA). Very drinkable, but a sipper rather than a gulper. I’m not sure you could have more than one in a session (the 7% ABV gives it a kick too!). Very, very nice - would love to try more in the range. With the footy back there may be a few posts that are put up following supping a beer or two. This may make them more incoherent, rambling, and typo filled than usual! (“They can get worse...” I hear you cry). Anyway, more reviews - including the very interesting Hitachino White Ale - to come soon!